Correcting some mistakes made to the wiring of my S3 and wanted to know how to run the number plate and reverse light wiring. I presume they both run from the LH side loom but can not feel a gap to run them into the void behind the trunk from the rear light, do they run under the lip of the boot by the petrol tank then through the small hole approx 1cm diameter into the void? you can get to the wiring on the RH side when you take the spare wheel out. The LH side trickier. Petrol tank out, or the easy way, remove the LH tail light. You should be able to see where the wires run from left to right and passes behind the boot locking mechanism, if I remember correctly. The license plate light is a good place to start pushing something through towards the two tail light openings. I find a piece of welding wire great for fishing wiring through tight areas like this. Alternatively, but not as flexible is a wire hanger. I already have the rear lh tail light out but unlike the rh side can not find a route into the void the number plate lamp and reverse lamp wiring goes into so wondered if they initially ran under the little ledge in the boot/trunk beside the petrol tank. My wires run in a cavity as explained. Maybe your car have had rear end repairs done to it, obstructing the cavity ? Have you tried pushing something (stiff wire, wire coat hanger ... ) through from the license plate light hole ? 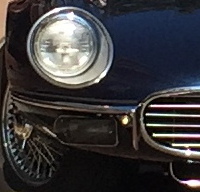 Found the holes on both sides for anyone else looking with the rear lights out of the car in the inner void it is on the top face closest to bumper almost as far in as you can reach. Then use a piece of wire to feed through and drag the number plate wires and reverse lamp wire.